This time of year, Montana turns cold. Precipitation falls from a cloudless sky. It is neither snow nor rain, but its crystals glint and stretch the space above land and river so that the foothills and Spanish Peaks on the southern horizon appear fragile and dimensionless, bands of muted color marking October. I am alone and hungry. Eric Crane, perched on the stone river bottom. My twenty-eight years have brought me just here, watching a fly line as the wind clips my ears and my nose. Downstream a mile, the pineboard gable of a chapel scrapes above a peninsula of wheat like the point of a razor. The current hooks around the granite escarpment at the peninsula’s tip and slaps and erodes the opposite bank, revealing the sinuous roots of a cottonwood tree. At the near bank lies a flat of dead water and the fish that I am after hold in the riffles beyond it. This run is called the Loch, perhaps to honor the brown trout introduced from Scotland’s Loch Leven over a hundred years ago. It has been aptly named. It is in this run that my father hooked what he called the “loveliest brown” he’d ever fought. He said, “You should have felt him, Eric. I thought I’d snagged a pylon at first, but he started moving and ran out like a bull. Like to God he’s big.” Now, if I work quickly and step between every cast, I will reach the Loch before the light fades. Beyond the peninsula, the east fork of the Gallatin meets her western sister, and they run wide and fast together. Here, however, the river appears stopped. Perhaps it has stopped. A static if remarkably corporeal shape, like the outstretched arm of a man. Light flickers over the shallow undulations of the skin. The current, however, chills my fingers. Maybe the fish will be as credulous as I am. Small ones, mostly, but a couple get fat in pockets and under the overhanging dogwood limbs. Prosopium williamsoni, the mountain whitefish, of course, abounds. My father used to say that every whitefish with its pinheaded catfish face and oval sucking mouth counts as one less worthy trout. He saw them as parasitic, which I didn’t agree with as a child. I preferred the slight tug of a whitefish to no fish, if I had to choose. It wasn’t until I started fishing in the cold autumns, which froze my hands with every dip in the water to pick the fly from the mouth, that I began to resent them. I had some pity, then, for my father, for the last fish he caught. Night had struck, and I had hiked back upstream from the cottonwood groves that I will not reach tonight. He had stayed at the Loch. I found him kneeling at the water’s edge, bent forward with the reverence of prayer. His headlamp illuminated his chapped hands and the pallid belly that they held. He slipped the barbless stonefly from the fish’s lips, and whispered, “You sweet louse.” When he released it, it hung in the water before faded like a pale shadow back into the river. Indian Summer still held a week ago. I waded wet out through the cowpie flats that now have frozen solid, that then had only crusted at the top, so that with every step I broke through and sank to my thighs in the sediment and dung. When I reached the river, I washed. I had not fished the Loch for two years, had seldom found the time to make the trip, and when I had, I’d brought my father to that spot which had once been his to give to me. I caught nothing that day but enjoyed the rhythms of the casts and the ache in my arms. Then, over the wheat field, I glimpsed a figure walking into the pineboard house that I have always called the chapel because of the white paint that once covered its walls. I have often felt a presence in these fields, as if I were being studied. Still, I never saw anyone there. I have fished here nearly twenty years, since I was nine, since my father graduated me from flipping spoons and dipping worms in the Three Forks Ponds to casting flies. He was a strong man, then, at forty-nine, and his stiff limp would carry him eighteen more years. I could not keep with his pace as he strode through the cattle pasture, and in the haze of summer the silhouette of his figure appeared like a mannequin puppeted away by the thin rod attached at his shoulders. He had fashioned that rod with blond cane, a six-foot, three-weight that made healthy trout feel as large as paddlefish. It is my rod today, a sort of deliberate instrument. The action is smooth and the touch is intimate. Playing a fish is like courting a reluctant lover. No fish bite now, as I stand to my knees in this river, cold even beneath the insulation of neoprenes. The stone bank is far behind me, the cowpie flats and pasture farther still. Fifty yards downstream a large shape like the severed trunk of a cottonwood lies in the water. I can’t make it out clearly, but it will be my marker. If I have no luck before I reach it, I’ll change flies. The East Gallatin is narrow and suited for the cane rod. I put each cast to the deep slow slot of water against the far bank, mend line to keep the streamer in the slot, pulse it as it crosses the current, search for stable footing a yard down, and cast again. The line floats like the green whisker of a dragon on the water. I still tense when the fly bumps the bottom or hangs up a moment on a rock, that sensate pause that anticipates the weight and pull of an invisible fish. The shape in the water is not a cottonwood log. It stinks of fermenting hay, and magpies fly from it as I wade near. It’s the carcass of a Hereford, an animal that I feared as a child. Walking through the cattle pastures that led to the river, the mid-bellies and nostrils of the beasts came level with my face. Cattle held a mythic status in my mind, then, bred from watching rodeo bulls—I cared little for their riders—the torrents of thousands of pounds of flesh that bucked and contorted, muscles graceful and horrific, the flock of the damned. Outside of the rodeo, people see cattle as fixtures on the landscape, unmoving shapes of variant bleak gradation. Walking among them, smelling them, they were very real to me. My father told me to lick my palm and stamp it with my fist whenever I saw a pure white cow. It would bring luck. But it never has and I can’t see that it’s right to wish for luck upon the dead. Water washes the beast’s face. Its hair is matted in rigid whorls, and I don’t care to smell it in any longer. Still, I must change flies and hope that fortune changes too. Something dark, more visible. A number two streamer, black marabou, with strands of flash, my father’s standby, which I have corrupted by adding golden eyes. 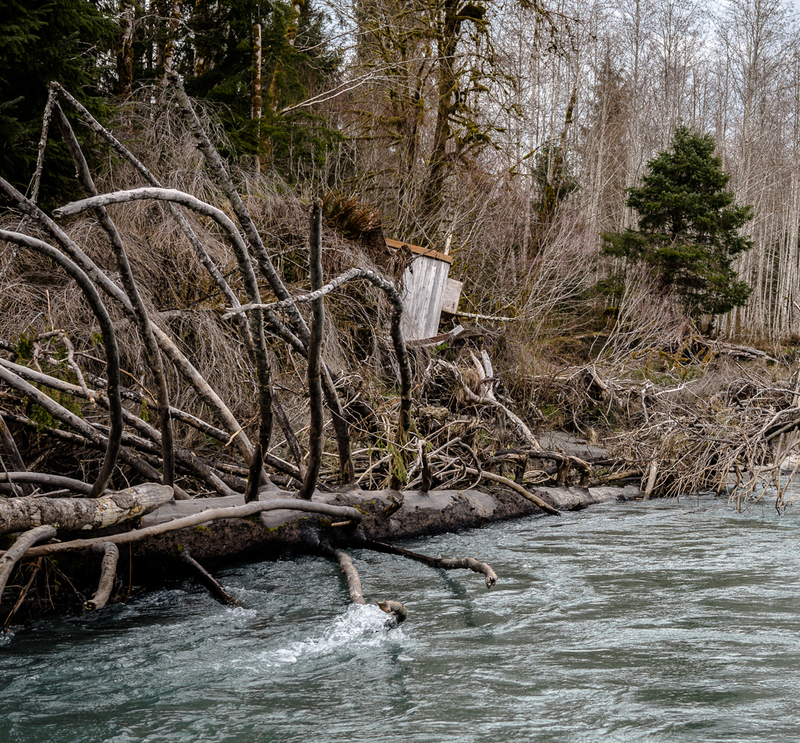 Thirty feet below me, a logjam creates an eddy near shore. I wet the knot of the new streamer in my mouth then drop it. There isn’t much day left, but I am at the wheat peninsula and the Loch isn’t far. In the summer I was fifteen, I came here alone for the first time. I envisioned owning the fields and the chapel and walking from its door to the river when I pleased, living so simply. At the edge of the bank, slack braids of barbed wire fenced off the land. I stepped over them then crossed the field that dazzled with fresh seed grains and stalks dropping in the wind, here and there exposing the pink flowers of bull thistle and Indian paintbrush. From the back of the field, the pentagonal face of the chapel neared. Its outer boards had faded and splintered. I ran my hand over them, up their vertical seams and over the frame of the door, emblazoned by the initials RJ. It opened when I pressed the handle. I slipped into the chapel, coughing. Everything of use had been emptied or was caked in the dust that moved through the air like minute insects. Sunlight lit the edge of a table and across it was a branding iron. RJ again. When I touched it, heat entered my fingertips. I ran out of the chapel even as I told myself the iron had only been heated by the sun. I can’t remember if I closed the door. I headed for the river, keeping my eyes at my feet, trying to keep my balance. I have never again believed I would own the chapel or the land. And now a light glows from beneath the eave of the roof. And a human shape is at the far edge of the wheat. I have half-a-heart to cross that field and introduce myself and relate my years’ old indiscretion. The line goes taught in my fingers, only a moment. A weak tap at the fly, then another, then nothing. I make the same cast, twitching line inch by inch, casting again, repeating the process, and each time with less hope. It’s hard to tell whether I tease the trout or it teases me. As twilight approaches, I hurry downstream past the logjam then walk the shoreline to reach the Loch. From the top of the granite escarpment, the groves of cottonwoods form as a single block above the fields, slightly darker than the deepening madder of the sky behind them. The stranger breaks that block, alone in the center of the field, closer now, legs shifting. I amble from the stone into the river flat. The water goes to my navel. I force myself to cast with patience. The line loops out to the head of the current then arcs into the slow water as I twitch it back. There is a tap on the fly and a tap again, the fish jostling it with his nose. Then the rod bends to the cork. As I strike and set the hook, a brown trout breaks the water, rolling its thick brass body on the surface then rushing out through the chop, through the swirling depths as I follow clumsily behind. The fish is my otherworldly guide. The reel labors against my palm, line spooling to coarser, thinner threads of backing. I am thankful when the trout turns and stops though even as I bring him into the dead water, as he nears me and slips beneath the surface on his side, messing it with his pectoral fin, he may still burst again into the current. Until he rests in my hands, I can only imagine the markings on his body, the umber stripe over his head and hump, the dark rings and dots on his yellow flanks and the black demarcation on the hook of his jaw. The trout pirouettes about the line, displaying his girth, some eighteen inches, perhaps, which I cannot touch though he is close. Finally, the line slackens, the hook is out, and the fish leaves me with my rod and string and steel and the knowledge that I tricked him, hooked him, fought him, and still he bettered me. It doesn’t matter. I felt him in the rod and tonight, we’ll both be tired. I tell her that I will, and she walks into her field and I turn back upstream and flip on my father’s old headlamp. The ground moves in stark, monochromatic spaces between the yellow stalks and their shadows. I march home in that light.